The welcome sign for the Village of Pleasant Mount. Mount Pleasant, Mt. Pleasant, Pleasant Mt. Pleasant Mount's Location within Pennsylvania. Pleasant Mount is an unincorporated community in Mount Pleasant Township, Wayne County, Pennsylvania. ^ White, Israel Charles; Dolph, John M. (1881). The Geology of Susquehanna County and Wayne County (Report). 23. Board of Commissioners for the Second Geological Survey of Pennsylvania. p. 59. Retrieved 30 January 2016. ^ White & Dolph. p. 170. ^ a b "Look up a ZIP CodeTM". USPS.COM. USPS. 2014. Retrieved 30 January 2016. ^ "District Magistrate". Wayne County, PA. Wayne County Courthouse. 2014. Archived from the original on 27 November 2014. Retrieved 30 January 2016. ^ a b Whaley, Samuel (1856). 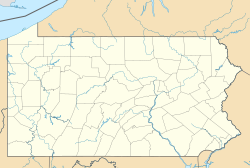 History of the Township of Mount Pleasant, Wayne County, Pennsylvania. A Discourse Delivered on Thanksgiving Day, November 22, 1855. New York: M. W. Dodd. p. 9. ^ a b c "Pleasant Mount". Geographic Names Information System. United States Geological Survey. 2 August 1979. Retrieved 30 January 2016. ^ "Biglow Lake". Geographic Names Information System. United States Geological Survey. 2 August 1979. Retrieved 18 February 2016. This page was last edited on 20 March 2019, at 00:18 (UTC).